Tuesday marked the 17th anniversary of the September 11th terrorist attacks in New York City, Washington DC, and Western Pennsylvania. Current and former members of the New England Patriots took time to reflect back, honor rand remember those lost on that tragic day with personal social media messages and photographs. To those we lost in a senseless act of terrorism 17 years ago, and those we lost trying to save, serve, and protect this great country we call home- Thank you. We still remember. This entry was posted in Patriots Twitter and tagged Braxton Berrios, Joe Andruzzi, Lawrence Guy, Tedy Bruschi, Tom Brady on September 12, 2018 by Robert Alvarez. Thursday night marked the New England Patriots first preseason game of 2018. Checkout some of the best sights and sounds over social media from the teams come from behind victory over the Washington Redskins. As the Patriots took the field for pre-game introductions, WR Julian Edelman led them out in a full sprint. He leaped in the air and pumped his fist at the end of his sprint, clearly fired up to be back from a torn ACL that sidelined him in 2017. It was an ugly first quarter for the Patriots offense as they failed to get much going. The Redskins took a 10-0 lead after a quarter of play. Belichick mouthed "f-ing BS" before they announce the play isn't challengable. In the second, Redskins quarterback Colt McCoy continued his hot start, and Washington added to their lead. 17-0 midway through the quarter. With the clock winding down on the first half, backup quarterback Brian Hoyer finally found rhythm and the Patriots got on the board heading into the half following a 52 yard Stephen Gostkowski field goal. 17-3 Washington. Heading into the locker room at halftime, head coach Bill Belichick was in regular season form when he was asked about his teams first half performance. The Patriots came out firing to open the second as running back Jeremy Hill tallied the teams first touchdown of the new year and cut the deficit to 7 at 17-10. Nice drive to start the second half, with Jeremy Hill scoring a TD from 1yd out to finish a 19 play, 84yd drive that lasted 10:16. In the fourth quarter the Patriots still found themselves trailing by seven, but newly signed wideout Cordarrelle Patterson hauled in his highlight catch to put the patriot in position to tie the game. Cordarrelle Patterson's been making those kind of catches all summer. 2018 Undrafted free agent Ralph Webb found the end zone to get the Patriots back in the game, however they weren’t looking to tie. Hoyer again found Webb for a successful two–point conversion attempt and their first lead of the night. 18-17 Patriots. Yes, it's the preseason, but that's impressive. An overserved member of the ticketholders is gonna wake up tomorrow without much of a voice. And probably just the memory of the Pats trailing 17-0. With under four minutes to go in the game, the defense stepped up as Geneo Grissom scooped up a loose football and nearly scored. Ralph Webb again found the end zone to seal the comeback victory for the Patriots. Starting off the preseason with a W.
.@JeremyHill33 checks in after win #1. This entry was posted in Patriots News, Patriots Photos, Patriots Twitter, Patriots Video and tagged Braxton Berrios, Brian Hoyer, Chris Hogan, Cordarrelle Patterson, Danny Etling, Eric Decker, Geneo Grissom, Ja'Whaun Bentley, Jeremy Hill, Nate Ebner, Ralph Webb, Rob Gronkowski, Ryan Allen, Sebastian Vollmer, Tom Brady, Trent Brown on August 12, 2018 by Robert Alvarez. For the first time in their NFL careers, the New England Patriots 2018 rookie class was officially assigned jersey numbers on Thursday. The full list, which is still subject to change, has number assignments that align more closely with each players respective position as opposed to the “non-traditional” numbers the rookies donned since their first days in pads this past spring. At the start of training camp, most rookies wore numbers in the 50’s and 60’s, making it difficult for observers to differentiate between them and the veterans. According to 985 The Sports Hub’s Matt Dolloff, the Patriots active roster is still dealing with duplicate numbers for multiple players, but they aren’t on the same side of the ball when viewing tonight’s game. New (rookie) numbers, who dis? This entry was posted in 2018 Patriots Training Camp, Patriots News, Patriots Twitter and tagged AJ Moore, Braxton Berrios, Christian Sam, Corey Bojorquez, Danny Etling, Duke Dawson, Frank Herron, Henry Poggi, Isaiah Wynn, Ja'Whaun Bentley, JC Jackson, John Atkins, Keion Crossen, Ralph Webb, Ryan Izzo, Sony Michel, Trent Harris on August 9, 2018 by Robert Alvarez. The Patriots are releasing wide receiver Malcolm Mitchell, according to NFL insider Jason La Canfora. Knee issues have dogged Mitchell since his playing days at Georgia and are the cause of his release. The Patriots tried unsuccessfully to shop Mitchell around this summer but his inability to get on the field had no interested parties. Mitchell, who just turned 25, was a key contributor in the Patriots Super Bowl run in 2016. He caught 32 passes for 401 yards and four touchdowns as a rookie, nearly all of it in the second half of the season. 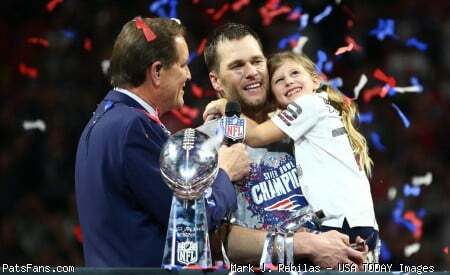 He missed part of that season with an elbow injury but came back and earned the trust of Tom Brady. He steadily gained confidence and was a huge part of the 4th quarter comeback against the Falcons in the Super Bowl. He caught five passes for 63 yards in the second half of the Super Bowl. His future looked bright, however, the very same knee issues robbed him of 2017. He never made it onto the field last season and his knee woes held him to just a couple of all-too-brief cameos this spring. That led to the Patriots shopping him unsuccessfully. The team can either convert him to IR again with an injury settlement or outright release him, depending upon the health of his knee. It is a case of oh-so-close for the talented wide receiver. So where does this leave the team? In the short term, it immediately opens up a roster spot, despite the fact he hadn’t been practicing. That will be filled quickly. But it was clear before training camp even began that Mitchell wasn’t going to be in the team’s plans for 2018. With Chris Hogan, Phillip Dorsett, Cordarrelle Patterson, Eric Decker, Kenny Britt, and younger players Riley McCarron, Braxton Berrios, Devin Lucien and Paul Turner, they have enough depth to carry them through the season. Although Britt too has missed some valuable time this camp. Julian Edelman will miss the first month of the season due to his suspension. As we posted in our 53-man roster projection this morning, Mitchell wasn’t on the roster and youngsters Berrios and McCarron were still on the outside looking in for a roster spot. It is a shame to see a player as talented as Mitchell lose his career on an injury. But the chances of another team taking a flyer on him at this point would remain pretty slim. 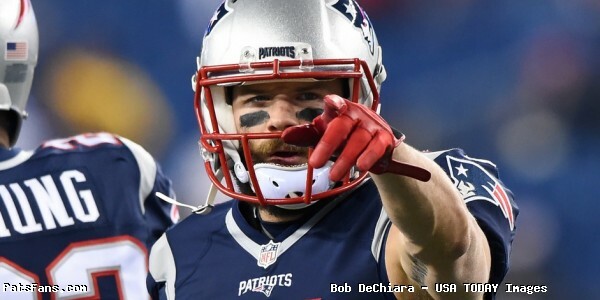 This entry was posted in 2018 Patriots Offseason, 2018 Patriots Training Camp, NFL Commentary, NFL News, Patriots Commentary, Patriots Injuries, Patriots News and tagged 2018 Patriots preseason, 2018 Patriots season, 2018 Patriots Training Camp, 53 Man Roster Projection, Bill Belichick, Braxton Berrios, Chris Hogan, Cordarrelle Patterson, Devin Lucien, Eric Decker, Kenny Britt, Malcolm Mitchell, New England Patriots, NFL, Patriots, Patriots wide receiver injuries, Patriots wide receivers, Phillip Dorsett, Riley McCarron, Tom Brady on August 6, 2018 by Steve Balestrieri. 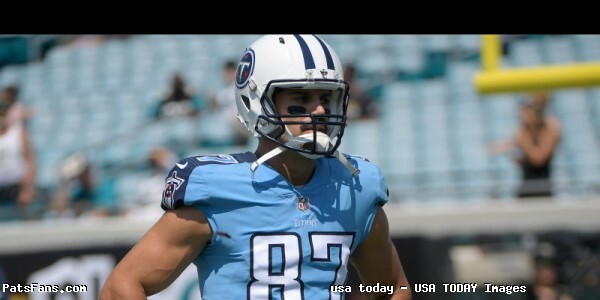 What Does the Eric Decker Signing Mean for the Patriots? With the surprising news that Jordan Matthews’ injury was severe enough for the Patriots to place him on IR, the Patriots lost out on one of the key free agent signings they made this spring. The team ended up releasing Matthews, I’m thinking, at his request as he probably believes that he’ll be ready to go a lot sooner this season. But back to the situation at hand, with Matthews gone, the Patriots saw this coming and worked Decker out before he was signed on Thursday. After nearly missing all of 2016 with the Jets, Decker signed with Tennessee and put decent but career low numbers since becoming an every-down player. He caught 54 passes for 563 yards (career-low 10.4 yards per reception) with just one touchdown. But he remains reliable, his 65 percent catch percentage was the second highest of his career. Can he revert to something akin to his last two years with the Broncos or the first two with the Jets or has he permanently lost a step. Part of his stats could stem from the struggles of the Titans offense. Last season they were just 28th in passing attempts and 23rd in yardage. Catching passes from Tom Brady should be more akin to better stats than Marcus Mariota. The biggest asset Decker brings to the Patriots is versatility. He can play outside as the Z- receiver or in the slot. As a slot guy, he’s much like Matthews, a bigger (6’3, 215 pounds) who relies on his size to box out smaller defenders. So how will the Patriots use Decker? Without seeing him run yet in practice, I see Decker as the Z-wide receiver, not the X. He will be used to attack the middle depth routes and work the perimeter and the middle of the field. They can move him around to create matchups in the slot where he logged about 50 percent of the Titans’ snaps last year when the opportunity avails itself. Phillip Dorsett has been seeing a lot of reps in the slot this summer and he’s been one for the more impressive players on offense. Right now, the wide receiver depth has Chris Hogan, Dorsett, Cordarrelle Patterson, Decker along with rookies Braxton Berrios and Darren Andrews with 2nd-year player Riley McCarron, and Paul Turner. 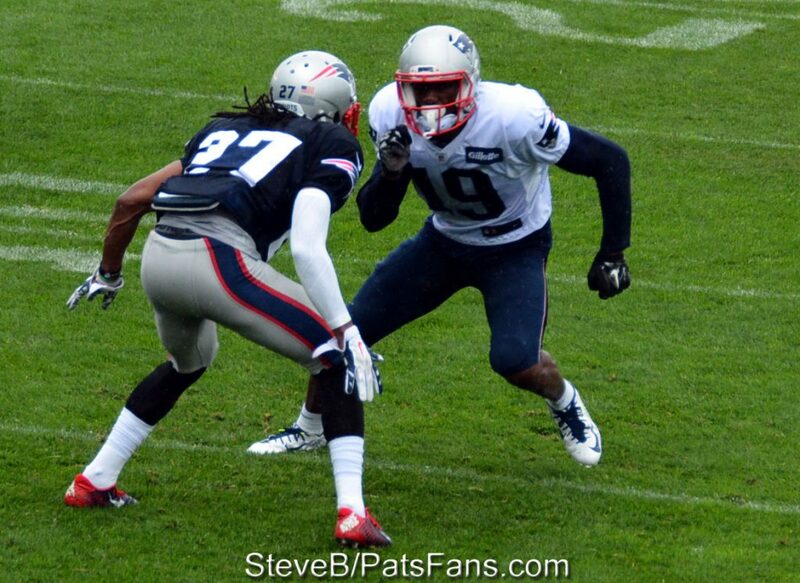 Veteran Matthew Slater is a wide receiver in name only, he’s a special teamer. Veterans Kenny Britt and Matthew Mitchell are not practicing yet and are considered day to day. Julian Edelman will return to the team Week 5 when his suspension is finished. Decker isn’t a lock to even make the team but I believe he’ll have enough in the tank to beat out one of the younger slot guys (Berrios/McCarron) but time will tell. He had just a tad of experience with Josh McDaniels in Denver during his rookie season. While the loss of Matthews is a blow, we thought he’d be an integral member of the offense in 2018, it certainly isn’t a death knell. Why? The Patriots still have plenty of talent at the wide receiver position. They like Britt and he’s only a year removed from a 1000-yard season. Dorsett appears primed to shake off his first season blues and be a bigger contributor. Patterson is the wild card, he’s never been able to produce like he was thought to be when he arrived in the NFL. But the Patriots are intent on finding him a role. And this team has so many other talented pass catchers at other positions. Rob Gronkowski is the gold standard among NFL tight ends. Jacob Hollister seems poised to make a big jump in production from Year 1 to Year 2 and has caught more passes from Brady this summer than anyone. And the production from Rex Burkhead, James White and Sony Michel at running back shouldn’t have anyone pushing the panic button. So while I’d temper expectations a bit for Eric Decker right now, I think he’ll be fine here. He’s at the age where his one-year deal comes at a good time for him. He’ll be very visible with the Patriots nationally and could parlay this into one more good payday. I expect him to be a model teammate (unlike the other guy fans were clamoring for) and be “all-in” immediately. While I have never been a big fan of Decker’s, the timing may be just right for him to come to New England and carve out a nice role for himself. His versatility will be a key facet in him being able to pick up the offense on the fly. Without being here all spring, and the first week of training camp, he’s well behind the rest of the receivers. However, it isn’t anything that can’t be overcome with hard work. Orchestrating all of this is Tom Brady, who has taken the Patriots deep in the playoffs and to a Super Bowl with far less talent than he has right now with this offense. The loss of Matthews and Edelman (for a month) is a blow but this team will be just fine. They always start off a bit slow anyway. No reason to panic and sound the alarm. In one aspect of this, they were fortunate that the injury happened in the first week of training camp rather than Week 9 or 10. 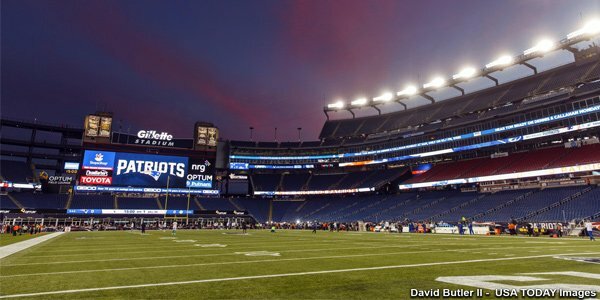 This entry was posted in 2018 Patriots Offseason, NFL Commentary, NFL News, Patriots Commentary, Patriots News and tagged 2018 Patriots offseason, 2018 Patriots Training Camp, 53 Man Roster Projection, Bill Belichick, Braxton Berrios, Chris Hogan, Cordarrelle Patterson, Danny Amendola, Darren Andrews, James White, New England Patriots, NFL, Patriots, Patriots Training Camp Photos, Patriots wide receiver injuries, Patriots wide receivers, Paul Turner, Phillip Dorsett, Riley McCarron, Rob Gronkowski, Tom Brady on August 3, 2018 by Steve Balestrieri. Over the past four days, rookies and veterans have begun their decent upon Foxborough for the opening of 2018 Training Camp on Thursday, July 26th. As a lead up, many new and tenured New England Patriots have taken to social media in the past week with motivational messages and photographs as the start of the new season nears. Check out some of the best below. Tomorrow starts an incredible opportunity I’ve waited my whole life for. Can’t thank God enough for having His hand on my life! This entry was posted in 2018 Patriots Offseason, Patriots Photos, Patriots Twitter and tagged Braxton Berrios, Chris Hogan, Christian Sam, Danny Shelton, David Andrews, Elandon Roberts, Eric Rowe, Stephon Gilmore, Trey Flowers on July 25, 2018 by Robert Alvarez. Well by now, as everyone heard, the NFL denied the appeal for Julian Edelman and he’ll be lost to the team for the first four games of the season. He was suspended for the first four games of the season for testing positive for an unknown substance which violated the league rules against PEDs. 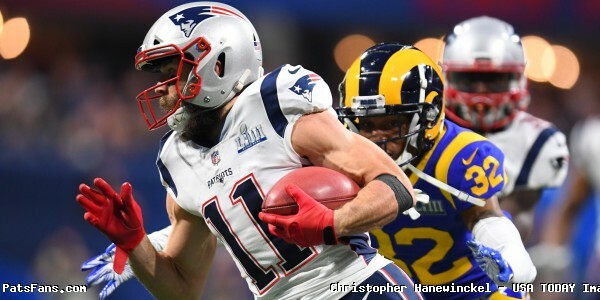 Edelman missed all of the 2017 season after tearing his ACL in a non-contact play during the preseason. He’s been trying to work his way all the way back. During the spring, the team at times kept him out of some drills, but it seemed more precaution than anything else. 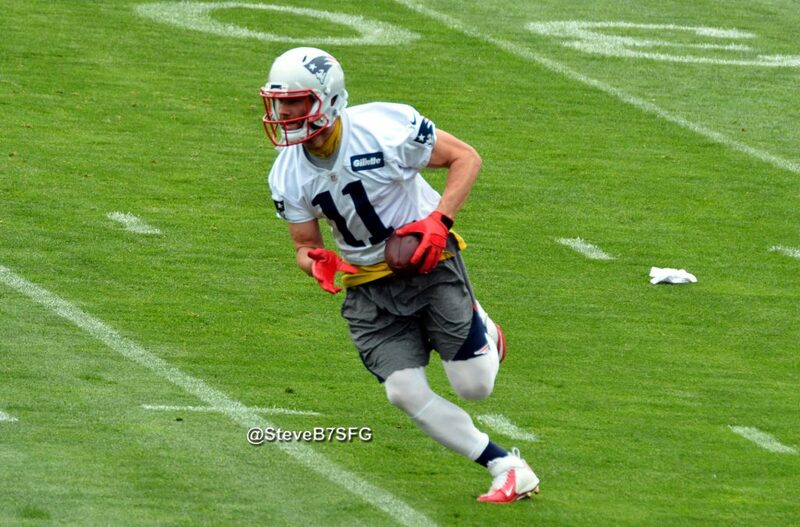 In the limited amount of time we were able to watch him, he looked like….Julian Edelman. Quick, able to cut on a dime and nearly impossible to cover in the short passing game. But now the team will miss him the first four games against Houston, Jacksonville, Miami and Detroit and make no mistake, despite being able to hum along without him last season, this is a big loss for the first quarter of the season. 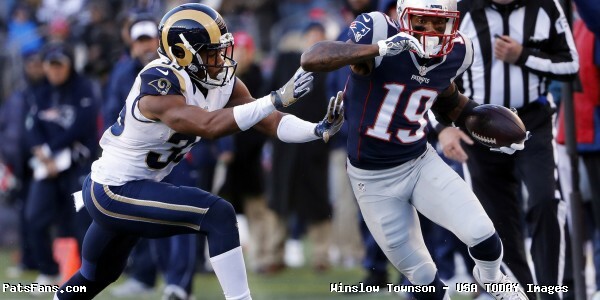 The offense lost three of its biggest playmakers as Danny Amendola and Dion Lewis left in free agency and the team traded Brandin Cooks to the Rams. So at wide receiver, the depth chart consists of Chris Hogan and a lot of question marks. While there is no denying the talent level is there with players such as Jordan Matthews, Kenny Britt, Phillip Dorsett, Cordarrelle Patterson, rookie Braxton Berrios, as well as the battle-tested but oft-injured Malcolm Mitchell, they haven’t worked for long in the system and the unknown element persists with all of them. The suspension now may change how they look at training camp and the preseason. Edelman will be gone for the first month of the season, they’ll have to juggle, getting him all the way back with a balance of limiting his workload initially. This suspension will no doubt put more pressure on tight end Rob Gronkowski and the running backs to produce more in the passing game. With Rex Burkhead and James White back in the fold, the team will look to Sony Michel to add that level of playmaking ability to both the passing and running games in 2018. The loss of Edelman for that first month of the season, where the Patriots are normally slow starters is a big loss, there is no getting around that. 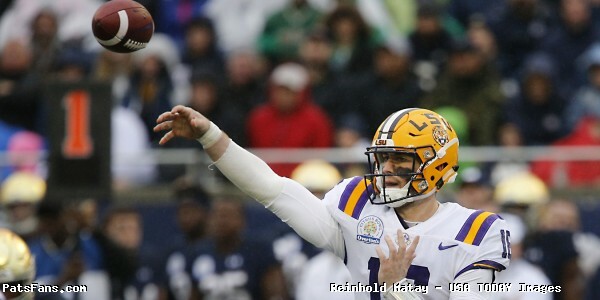 But it opens a window of opportunity for the other players to step up and for at least one of them, it may lead to a four-week reprieve that could lead to him becoming a regular part of the offense. We wrote on Sunday that the snaps in the slot are now wide open and up for grabs. Mitchell would be the first choice to snag them up but his health is a big question mark right now. Berrios and 2nd-year practice squad player Riley McCarron seem cut from the prototypical Patriots slot receiver mold, and they’ll have plenty of opportunities both in practice and in four preseason games to turn the coaches heads and carve out a role for themselves. Our money here is on Jordan Matthews who has been able to thrive in many different offenses so he’s able to learn a new one and become productive right away. He brings a different element to the mix, he’s 6’3, so he presents a much larger target especially in the red zone. Of course, this puts more pressure on Tom Brady and the soon-to-be 41-year-old QB has always been equal to the task. He’ll be operating without two of his best friends and most trusted receivers in Amendola and Edelman but something tells me he’ll be able to weather the storm until Edelman returns in Week 5 and the newer players find their rhythm in the Patriots offense. It won’t be a walk in the park and at times they may struggle, as they always do early in the season. That’s what makes every year so different, so compelling and ultimately so much fun to watch. I’d place your bets on #12 getting it done this year even without Edelman for the first month of the season. 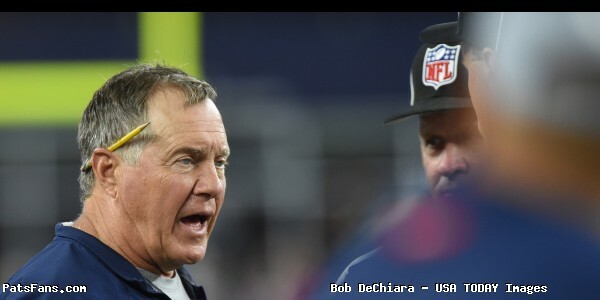 This entry was posted in 2018 Patriots Offseason, NFL Commentary, NFL News, Patriots Commentary, Patriots News and tagged 2018 NFL Season, 2018 Patriots offseason, 2018 Patriots preseason, 2018 Patriots Schedule, 53 Man Roster Projection, Bill Belichick, Braxton Berrios, Chris Hogan, Cordarrelle Patterson, Danny Amendola, Jordan Matthews, Julian Edelman, Kenny Britt, Malcolm Mitchell, New England Patriots, NFL, Patriots wide receivers, Phillip Dorsett, Riley McCarron on July 5, 2018 by Steve Balestrieri.